Leopards are a rich yellow in color and covered in dark spots. They are about six or seven feet in length and they weigh an average of 150 pounds. 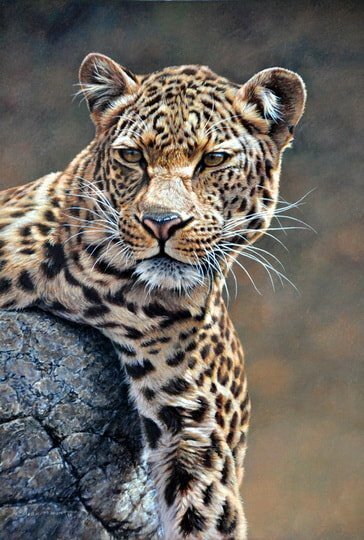 Leopard Painting By Alan M Hunt. Leopards are found throughout Africa, however they do not inhabit the Sahara Desert. The Leopard can make a loud deep roar. They are keen hunters, and feed on a wide variety of food sources. They will eat insects, to rodents, to extremely large animals such as a giraffe or buffalo. They are extremely agile, and can climb trees with ease. They will often seek shelter in trees, and use their vantage point to survey their surroundings. They hunt alone, and they do it silently. The leopard will hide itself behind plants or amongst tall grass, and silently creep closer to its prey, then hide again. Once they gain a capable distance, they will accelerate and take down their prey. The most secretive and elusive of the large carnivores, the leopard is also the shrewdest. Pound for pound, it is the strongest climber of the large cats and capable of killing prey larger than itself. 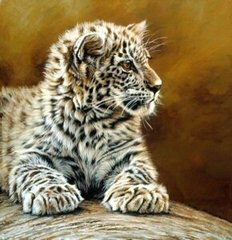 Leopards come in a wide variety of coat colors, from a light buff or tawny in warmer, dryer areas to a dark shade in deep forests. The spots, or rosettes, are circular in East African leopards but square in southern African leopards. 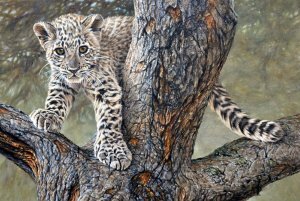 Dense bush in rocky surroundings and riverine forest are their favorite habitats, but leopards adapt to many places in both warm and cold climates. Their adaptability, in fact, has helped them survive the loss of habitat to increasing human settlement. 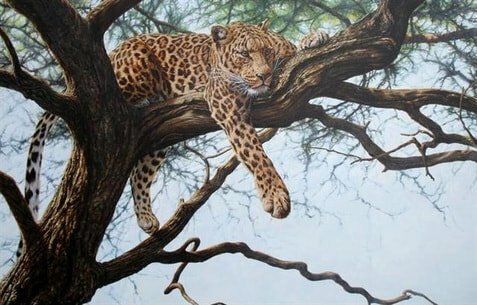 Leopards are primarily nocturnal, usually resting during the daytime in trees or thick bush. The spotted coat provides almost perfect camouflage. ​Leopards are solitary creatures and predominantly nocturnal. Each individual has a home range that overlaps with its neighbors; the male's range is much larger and generally overlaps with those of several females. Leopards continually move about their territory, seldom staying in an area for more than two or three days at a time. Ranges are marked with urine and claw marks and leopards announce their presence to other leopards with a rasping cough. Leopards also growl, roar and purr. A litter includes two or three cubs, whose coats appear to be smoky gray as the rosettes are not yet clearly delineated. The female abandons her nomadic wandering until the cubs are large enough to accompany her. She keeps them hidden for about the first 8 weeks, giving them meat when they are 6 or 7 weeks old and suckling them for 3 months or longer. The most elusive of the large carnivores, the leopard is a cunning, stealthy hunter, its prey ranges from strong-scented carrion, fish, reptiles and birds to mammals such as rodents, hares, hyraxes, warthogs, antelopes, monkeys and baboons. Both lions and hyenas have been known to take away a leopard's kill. To prevent this, leopards store their larger kills in trees where they can feed on them in relative safety. 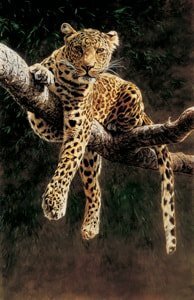 The most widespread of the felines, leopards occur in regions across both Africa and Asia. Indeed, their adaptability to both warm and cold climates has helped them survive the loss of habitat caused by increasing human settlement. However, leopards have long been preyed upon by man. Their soft, beautiful fur has been used for clothing. The tail, claws and whiskers of the leopard are popular as fetishes. 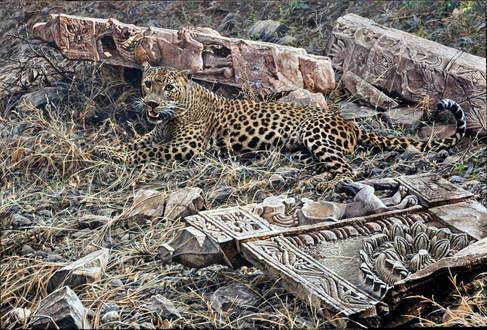 In some areas farmers try to exterminate them, while in others leopards are considered symbols of wisdom. Both lions and hyenas will take away a leopard's kill if they can. To prevent this leopards store their larger kills in trees where they can feed on them in relative safety. The elegant, powerfully built leopard has a long body, relatively short legs and a broad head. Its tawny coat is covered with dark, irregular circles called "rosettes."